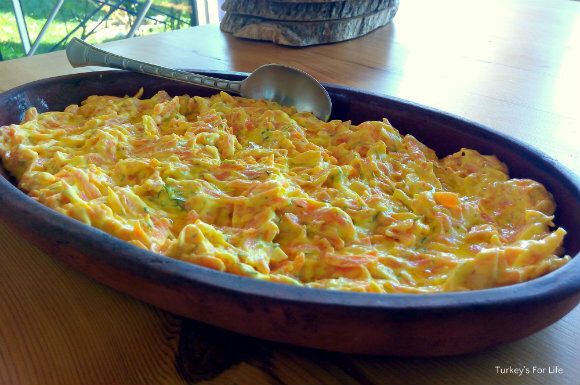 Turkish garlic yoghurt with carrots (sarımsaklı yoğurtlu havuç salatası) is a meze dish that we usually only have the pleasure to eat in the home. You sometimes get to eat this tasty Turkish carrot salad on the Blue Bays boat trips around Fethiye but, for whatever reason, the Turkish restaurants we frequent in Fethiye never seem to have it available in their meze fridges. It’s a regular on our table at home because it’s a super tasty way to use up any surplus carrots lurking in the fridge (if we’re shopping at Fethiye Market or Çalış Market, we always manage to buy far too much produce). The sweetness of the carrot complements the flavour of the natural yoghurt, perfectly. And, well, it just looks so appetising – the orange of the carrot mixing with the olive oil and creating a colourful garlic yoghurt dip. You can never have too much yoghurt in a Turkish kitchen and we find garlic yoghurt with carrots an easy and interesting alternative to the multitude of other yoghurt-based Turkish meze recipes, such as cacık and haydari. Perhaps because the carrots are not added to the yoghurt in their raw state – they’re sauteed first – once they’re added to the yoghurt, the new flavour is not dissimilar to home made mayonnaise. Sauteing the carrot brings out their natural sweetness and it’s this sweetness that makes this Turkish carrot yoghurt dip stand out from other yoghurt-based meze plates. 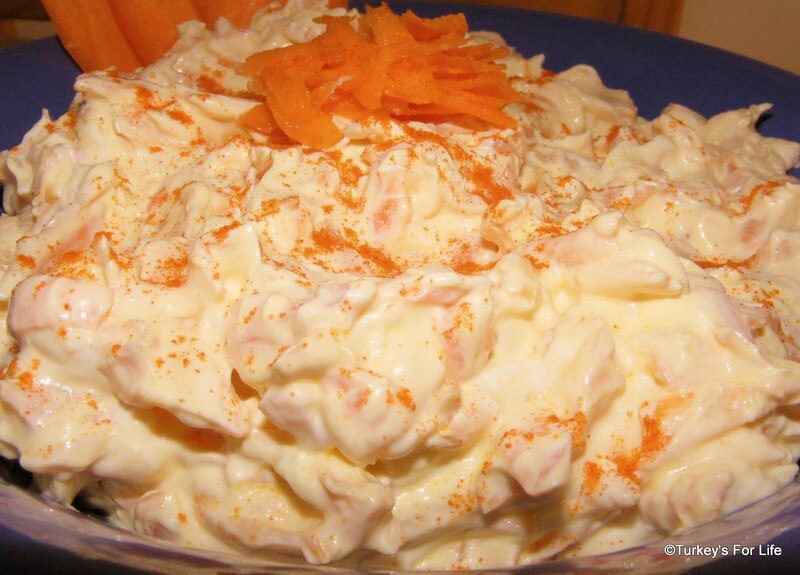 Carrots with garlic and yoghurt can be whatever texture you like. It’s all down to the amount of ingredients you use. When you saute your carrots, it’s up to you how much olive oil to use. We use more than we used to in this recipe because our tastes have changed over the years. We used to like a thick and creamy garlic yoghurt with carrots but these days, we prefer a looser consistency. Take a look at other people’s yoğurtlu havuç and you might see a really runny consistency with lots of olive oil and few carrots. Or you might see an almost solid, creamy block. Experiment with the consistency until you get the one to suit you. 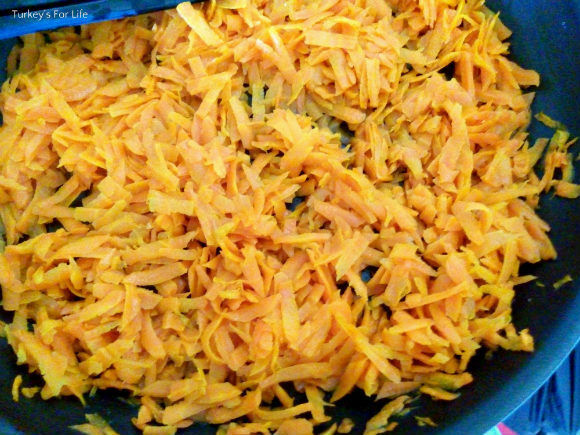 When you saute your grated carrot for Turkish carrot yoghurt dip, you need to do it on a medium heat and stir them until they start to soften. Don’t let them go mushy but you do want to take the crunch away. For anyone like me who gets stomach upsets from raw carrot, sauteing them is your saviour. Once the carrots have cooled, it’s just a case of mixing in the rest of your ingredients and then transferring your garlic yoghurt with carrots meze into a serving dish. Right, let’s get down to making this simple garlic yoghurt with carrots. And, if you’ve never had the pleasure of tasting this before, we’re sure you’re gonna love it and will be making it again and again. And that’s how we make the Turkish garlic yoghurt with carrots meze. Very quick and easy. And look at those lovely sunny colours once your yoghurt has taken on the carrot-infused olive oil. We never used to add dill to this carrot salad but, as we said above, our tastebuds have changed over the years. We’re still careful with it though, otherwise it can be really overpowering and you lose the sweet taste of the carrots. If you’re like us, add your dill a little at a time and keep doing a taste test. If you’re leaving your garlic yoghurt with carrots in the fridge for a while before eating, bear in mind that the flavour of the dill will become stronger. Garlic yoghurt with carrots goes well on a meze table along with lots of other tempting dishes or you can use it as a side or a filling. We like to eat it with homemade köfte and we’ve also had it as a filling in a jacket potato; kumpir. It works! If you want to get creative in the kitchen, we’ve got lots of Turkish recipes you can experiment with. I’ve never heard of this before or had it but it sounds good– thanks for introducing something new to me! @ Karen: It’s certainly not very common in Fethiye but we really like it. That sounds like a tasty/healthy combination with the jacket potato! This is one of my favorite mezes. I can eat anything based on yogurt and garlic. And this one looks so appetizing! 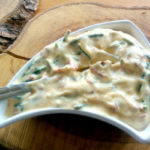 I sometimes add a little crumbled walnuts in this yogurtlu havuc, and it becomes a wonderful spread for a slice of bread. @ Zerrin: Thanks for the tip. We’ll get some walnuts next time we make yogurtlu havuç and give that a try. I would have eaten my carrots as a kid if it was like this (and yes, chili is a must!) PS YES another chance for the new year! @ Belinda: It’s amazing how much more veg we eat since coming to Fethiye. The ways it’s used in Turkish recipes are so much more palatable than the boiled veg of England. I had this in Sivas a couple of years ago. It was 50/50 fried carrots and potato, like a Rosti, and had the garlic and yoghurt sauce with chilli flakes, mint and lemon. Mmm great recipe, tasted just like the one I tried in Turkey. was wondering what else you can put with it? Jacket potato sounds good, but what else?? I thought I’d died and gone to heaven when we had this dish. I will definitely be trying to replicate it now that I’m home. 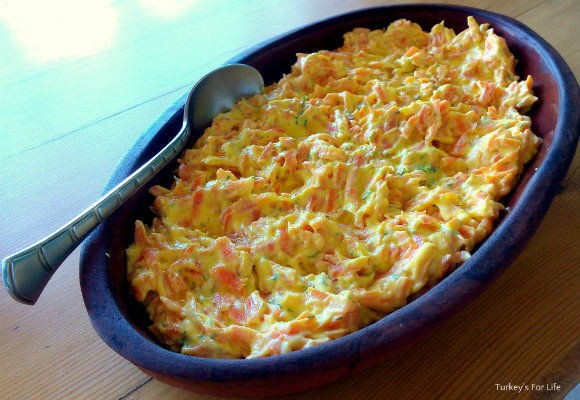 We have a restaurant in Vaasa (Finland) that serves this type of carrot meze. I had to google for the recipe as it is delicious. I have been in Turkey twice and the food is just aaaaamazing! Now you mention it I realise that I only eat this on boat trips or at home too. I wonder why it isn’t popular in restaurants?